Coordonnateurs : Dutt Ashok K., Noble Allen G., Costa Frank J., Thakur Rajiv R., Thakur Sudhir K.
This double-volumed work focuses on socio-demographics and the use of such data to support strategic resource management and planning initiatives. Papers go beyond explanations of methods, technique and traditional applications to explore new intersections in the dynamic relationship between the utilization and management of resources, and urban development. International authors explore numerous experiences, characteristics of development and decision-making influences from across Asia and Southeast Asia, as well as recounting examples from America and Africa. Papers propound techniques and methods used in geographical research such as support vector machines, socio-economic correlates and travel behaviour analysis. 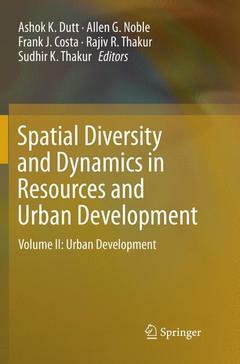 Readers are invited to consider the dynamics of spatial expansion of urban areas and economic development, and to explore conceptual discussion of the innovations in and challenges on urbanization processes, urban spaces themselves and both resource management and environmental management. Together, the two volumes contribute to the interdisciplinary literature on regional resources and urban development by collating recent research with geography at its core. Scholars of urban geography, human geography, urbanism and sustainable development will be particularly interested in the work presented here. Dr. Frank J. Costa is Professor Emeritus, Department of Geography, Planning and Urban Studies, University of Akron, Akron. He has published in a wide variety of planning, urban studies and geography journals worldwide. He has edited and co-authored several books. Dr. Ashok Dutt is Professor Emeritus, Department of Geography, Planning and Urban Studies, University of Akron, Akron. He is the leading exponent of urban and regional development and planning and has contributed nearly 350 research papers. He is the editor/author of 27 books. Asia. He has authored several books including Barns in the Midwest. Dr. Rajiv Thakur is Assistant Professor of Geography at the Department of Geosciences, Missouri State University, West Plains. He is an Economic Geographer with research interest that centers on regional innovations and cluster-based economic development. His publications are in the field of regional economic development. Dr. Sudhir Thakur is Associate Professor at the College of Business Administration, California State University, Sacramento. He has research interests in the areas of regional economic systems, technological change and regional development, location and land use and spatial econometrics. He has published among others with the Structural Change and Economic Dynamics and UNU-WIDER.